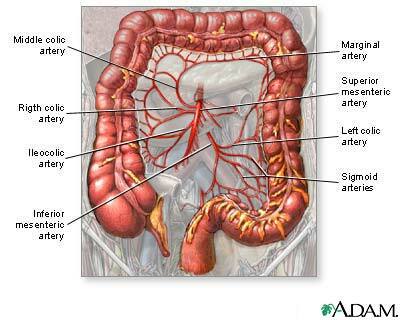 The blood supply to the large intestine originates in the superior and inferior mesenteric arteries. Updated by: Subodh K. Lal, MD, gastroenterologist at Gastrointestinal Specialists of Georgia, Austell, GA. Review provided by VeriMed Healthcare Network. Also reviewed by David Zieve, MD, MHA, Isla Ogilvie, PhD, and the A.D.A.M. Editorial team.